“You’ll shoot your eye.” A tongue stuck to a freezing pole. Ominous images of Santa while a young boy careens down a slide. For anyone who has seen and loved the iconic film A Christmas Story, all of those memorable moments find themselves brought to life on stage at the Havre de Grace Opera House in Tidewater Players‘ production of the musical of the same title, Directed by Laurie Starkey, with Music Direction by Stephanie Cvach, and Choreography by Amanda Poxon. In addition to the expected elements of the film, there is a score by Benj Pasek and Justin Paul (of Dear Evan Hansen fame) and Book by Joseph Robinette that brings new nuances to the original story. With a multi-generational cast, a fun Christmas message, a lot of big dance numbers, and a few tender moments, this production is certain to warm the hearts of audiences both old and young. The stage is set from the moment that audiences enter with a Christmas tree and lights hung all around the stage. While the set design is simple, there is a careful eye to detail in the set dressing that really makes the Parker home come to life. Set Designers Dickie Mahoney and Laurie Starkey have focused on the details with the pictures on the mantle and coats on the coat rack. It instantly feels like a home. Several simple and quick movements transform the entire space into a variety of other locations. Adding to the overall tone and mood set with each location is a Lighting Design by Thomas Gardner. He is especially able to demonstrate his creativity in moments like the slow-motion exchange with Santa. There are several instances in which the lights are the perfect accompaniment to Ralphie’s current emotional state. Carefully selected or designed props (like the leg lamp) and costumes (like the Elf costumes and the pink bunny suit) are more strong homages to the movie that are equally entertaining to new audiences. However, the stage really comes to life when it is inhabited by the residents of Hohman, Indiana. The ensemble, both young and old, is full of life and energy. The script also allows for many of them to take scenes and make them their own. Stacey Bonds and Samantha Jednorski have an entertaining turn as Santa’s Chief Elves. Reagan McComas delights as he tries to sing with his tongue stuck to a pole. Sophia MacKinnon is adorable as she lists her wants to Santa and impresses in an early scene by freezing perfectly to give the illusion that her hand is pressed against a glass window. Carly Greaver is consistently alive with energy and really bring her choreography to life. Michael Maroney has the audience in stitches with his turn on Santa’s lap. He and Braeden Waugh shine in their slick dance routine in their suits. Chip Meister brings a chuckle with his portrayal of a tired department store Santa. As Miss Shields, Amanda Poxon provides a larger-than-life character and a stunning turn on the dance floor. All of these little bits and moments bring the world around the Parkers to life. Right at the center, literally bringing the Parkers to life, is the narrator, Jean Shepherd. Tom Hartzell bring a genuine folksy warmth to the role. Especially strong are his physical reactions and facial expressions in the way that he sometimes squirms with the excitement of his child self and other times gazes at these younger versions of his parents with a longing that makes us wonder if they are still around. He looks upon the events in such way that the audience members feel like they really are seeing the events through his memory. As his younger counterpart, Jamie LaManna gives a solid performance as Ralphie. It is a huge role and a huge score for a young actor, and he conveys himself with poise and has a lovely tone quality to his voice. LaManna really comes into his own as actor, just as his character matures, in the touching “Before the Old Man Comes Home.” His interactions with his brother Randy (played by the adorable Evan Christy) are warm and genuine. What really makes this production though are Ralphie’s parents: The Old Man (Gary Dieter) and Mother (Eva Grove). Dieter brings just the right blend of loveable and curmudgeonly to his portrayal of Ralphie’s father. So much of the character’s material is subtext. There are clearly concerns about money and the pride that goes with that for a father, which Dieter brings to the front with just the right amount of subtlety. It doesn’t hurt either that Dieter gets to show off his skill as a showman in two big dance numbers, walking over a chair and breaking out his tap shows. It is almost as if this role was written just for him. Right over his shoulder though is the emotional heart of the entire production. Grove’s performance as Mother is practically flawless. She never appears to be performing. Every word and gesture is natural. She feels like your own mother or grandmother in the safety and warmth and joy that she brings to the Parker family and to the entire show. Nowhere is this more evident than in the beautiful moments of “Just Like That.” I can’t imagine that I was the only audience member with tears in my eyes. Grove commands the stage without ever trying to do so and, therein, creates the emotional center of everything. Overall, there is a lot of energy and heart on display in this production. Even though there are a few spots in Act One where the script seems to drag a little, Director Laurie Starkey does an excellent job of planning transitions and moments that keep things moving along quickly to the next joke or large musical number. Choreographer Amanda Poxon keeps the cast moving throughout a significant amount of dance. When the cast comes together and all hit their marks, the choreography is fun. In a cast with a ton of big numbers and some members of the cast who may not be natural dancers, she really finds way to help them sell the choreography. Similarly, despite a few clear winter colds and a relative weakness in harmony, Musical Director Stephanie Carlock Cvach pulls out strong soloists and focuses the cast on signing mainly in a robust unison. The strong work by the cast and production team was evident in the constant laughter, hooting, and applause by the audience. There were chuckles of appreciation from fans of the movie and gasps of delight from the children. My 8-year old daughter walked around all night singing “When You’re a Wimp,” clearly a fan of the score. Certainly, with the theme of the show resonating in my head, I appreciated it all the more, because “just like that the moment’s gone.” Young or old, fans or not fans of the movie, there is something for everyone to enjoy in this production. There is no doubt that you will leave ready to embrace some Christmas stories of your own. This is what I thought of Tidewater Players’ production of A Christmas Story… What did you think? Please feel free to leave a comment! A Christmas Story will play through December 2 at Tidewater Players at The Cultural Center at the Opera House, 121 N. Union Street, Havre de Grace, MD. Purchase tickets at the door one hour before show time or purchase them online. This entry was posted in Reviews and tagged A Christmas Story, Amanda Poxon, Braeden Waugh, Carly Greaver, Chip Meister, Dickie Mahoney, Eva Grove, Evan Christy, Gary Dieter, Jamie LaManna, Laurie Starkey, Michael Maroney, Reagan McComas, Samantha Jednorski, Sophia MacKinnon, Stacey Bonds, Stephanie Cvach, Thomas Gardner, Tidewater Players, Tom Hartzell by Jason. Bookmark the permalink. As a member of the cast, I want to express my appreciation and admiration for the young people in the company. Talented, focused, and energetic barely begin to describe these performers. At a time when we can sometimes worry about the future of our society, young people like these renew my faith in the future. 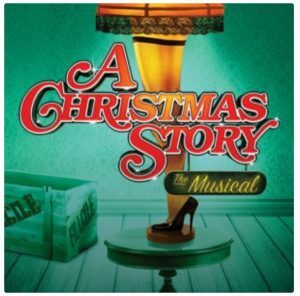 It’s a really fun show, so I hope everyone gets an opportunity to enjoy “A Christmas Story”!